In our last lesson, in our look at working with Cinema 4D Lite, we talked about the Cinemaware plugin, and how it bridges the gap between Cinema 4D Lite (C4D Lite) and After Effects. In this lesson, let’s create our first project file to work with in both C4D Lite and After Effects. Now, many people would think that you would open C4D Lite to create the file to then import into After Effects. That is actually not the case. The actual file creation process is done from After Effects, and then C4D will open from there. The reason for this workflow is that there is actually no way to open C4D Lite outside of After Effects. Navigate to FILE>NEW>MAXON CINEMA4D File. Once you do that, a save dialogue box will appear asking you to choose a location and name to save your file as. Then Cinema 4D will open, and you’ll be all set to go! 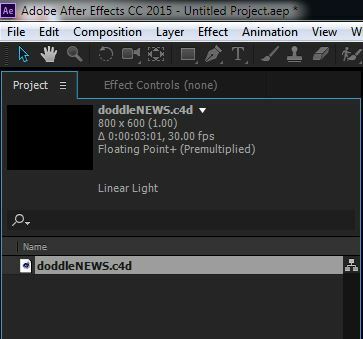 What’s important to keep in mind is that what’s happening on the After Effects side of things is that the .C4D file has been created in the requested location, and has been imported into After Effects, so the instant you hit CMD/CTL+S on the keyboard, your file will be updated, and ready to drop into a comp. In our next lesson, we’ll take a tour of the Cinema 4D Lite interface, so you can get a bearing on your new surroundings.